The glowing reviews of guests who stayed at Houseboat Arden show that the effort being put in their houseboat has paid of. Owners Juul and Iris wanted to create a relaxed haven in the busy city of Amsterdam, the location of their houseboat rental service. The result is very close to the forest 'Arden', described by Shakespeare: a place to escape to and find love and inner peace. The outside of this 65 square meter houseboat close to the Jordaan area is furnished with red ceder wood, giving a warm and organic feeling to it. Inside the boat you'll find a lot of wood too. Especially on the walls; those are covered with the wood of used pallets - an small referral to his father who owned a pallet and crate factory for decades. What is a forest without a decent lake? That question was raised when designing the boat and the answer was given in a huge bathroom. 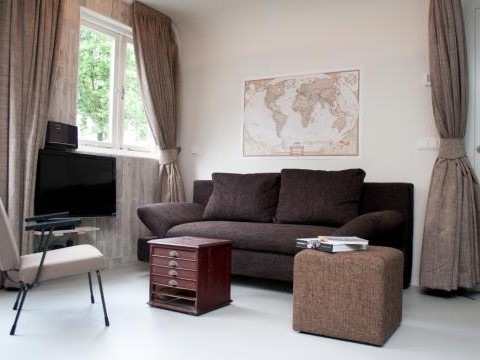 The rainshower and bath have given so much pleasure to the guests who have stayed here and guests who will hire this houseboat in Amsterdam. Want to know more about this houseboat rental, visit the detail page of houseboat Arden.